Learn what makes France, France by taking virtual tours of all the major wine regions. Taste, learn about the rules and regulations, the culture, the traditions, and the cuisines as you go. Expereince first hand the fundamentals of what makes France the benchmark for the world of wines. As with all truly great wine regions, there’s no place quite like it. Alsace, that curious amalgamation of history and culture, a melding of French and German, produces wine that is clearly and distinctly different, a unique combination of cultures coinciding in one place. Instantly recognizable, the wines and cuisine reflect the place and the culture. Riesling and Choucroute, Pinot Gris and Tarte a la Alsacienne, Kugelhopf and Cremant d'Alsace...the pleasures are profound. Explore the beauty that defines Alsace, a place you'll never forget. Champagne. Both a wine and a place. And both wine and place have been admired, revered, and valued through the years---and shamelessly copied as well. But there is no place like Champagne, and thus there cannot be any wine like Champagne. Explore the most well known and highly respected sparkling wine in the world in all its myriad glories, while learning about the place, the people, and the foods of the region. 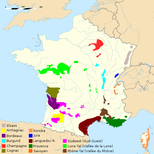 throughThe Loire Valley was destined to be a vital and important region from the beginning; its location, geography and climate guaranteed that it would be crucial in the formation of modern France. The viticultural importance of the region was just as important, and just as inevitable. Explore this winding river valley from the Atlantic to the Massif Central, through the wines and foods and stories of the region. From Le Troglodyte to the great Chateaux de Loire, you'll take a slow ride through the the cradle of modern France. Bordeaux: For hundreds of years it has reigned as one of the great wine regions of the world. And even amongst that selected few it stands alone. Bordeaux is huge, and produces a huge volume of wine of all types, but it is justifiably regarded as the icon of sophisticated red wines in the grand style, crisp and lively whites, and sensuous and honeyed complex dessert wines. Often imitated; never duplicated; Bordeaux remains unique. Explore this vast region in all its complexity through its wines and characteristic foods. Burgundy. That single word conjures up visions of a fabled place. No other wine region in the world is as devoted to the concept of terroir, the exaltation of place. And no other region has established itself so firmly in the mind of the wine and food lover as Burgundy. It is the homeland of two great wines from two great grapes: Chardonnay and Pinot Noir. All the world holds Burgundy as the exemplar, the icon, the template, and the goal. None succeed; Burgundy remains supreme as the Holy Grail. And with great wine you must have great cuisine as well. Sample both in this tasting. There are few wines as uniformly joyous as those from the Gamay grape in Beaujolais. This region poised between the cooler north and the warmer, more sultry south of France is rugged and charming. That is reflected in their wine and their foods. Explore the amazing beauty of Beaujolais through its wines and foods, and you'll be planning your trip shortly afterwards. This complex, multiply blessed region, divided between the profound Syrah-based wines of the north and the plethora of variegated grapes and blends that define the southern portion in distinctive and lovely red and whites and salmon-orange roses. From Cornas to Chateauneuf-du-Pape to Tavel and Lirac and the village wines of the Southern Rhone, you'll discover a garden of vinous and earthly delights. The South of France is a smorgasbord...a buffet of delights that encompasses sun-drenched Provence, rugged Corsica, the variety of the Languedoc-Roussillon, and the little known but lovely wines of the Sud-Ouest. Take this fascinating journey through much of the most ancient and complex of French regions, and Taste & Compare the differences in the wines.